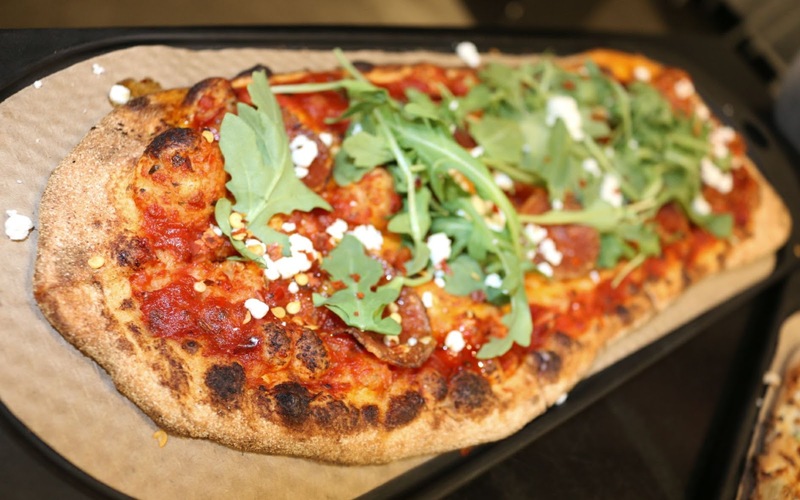 Originating from D.C., &pizza was one of the first fast-casual and quick-serve pizza spots to make its mark across the east coast. With locations stretching to NYC, Virginia, and Philly, they're seeking to ensure that quick-serve pizzas are deliciously handmade. As an anti-establishment ethos hocking creative pies, I was excited to stop by to check out &pizza's Philly outpost. Located on 15th and Walnut. &pizza is sleek, open, and modern. In addition to pies, they have craft fountain sodas including ginger-berry lemonade, burdock & anise root beer, mango & passion fruit, dark cherry cola, pear & fig elixir, and cereal milk cream soda (think Momofuku Milk Bar)! They've even got home-brewed teas like unsweetened lemongrass-peach, sweet peach-ginger, and sweet mint. But I digress ... let's get on with the pizzas! Step up to the counter and you can order the tried and true classics. Or you can craft your own, by choosing either a traditional, ancient grain, or gluten free dough for $2.78 extra. 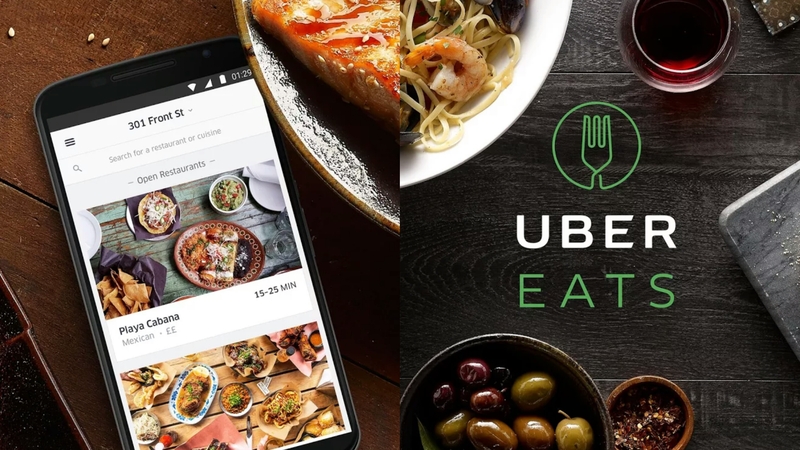 Then you layer a choice from a variety of sauces, including classic or spicy tomato, buffalo sauce, garlic ricotta, mushroom truffle, or basil pesto. Pick your cheese, a myriad of toppings, and you're set! First off, the dough is crusty and nicely leoparded - perfect to act as a vessel to house a myriad of toppings to create flavor bombs. The American Honey has kick from the spicy tomato and red pepper flakes, heft from the meaty pepperoni, bitter freshness from the arugula, and a cooling creaminess from the goat cheese and honey. Consider me moonstruck with the mushroom truffle pie. 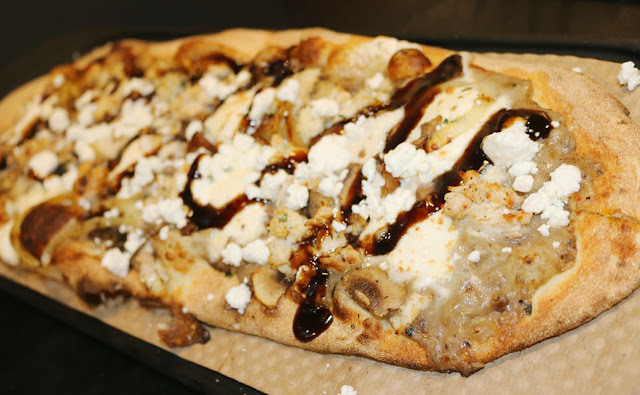 Garlic ricotta and a rich truffle sauce acts as a base, with the grilled onions and goat cheese partnering up for sweetness and tang. I even asked for chicken here for additional substance. Fig balsamic brought forth some sweetness to tie it all together. The Farmer's Daughter is pretty special. You can request your eggs to be cracked over-easy or scrambled in your pie. A melange of Italian sausage, red pepper chili oil, and spicy tomato provides you with a hearty bite with a bit of kick. 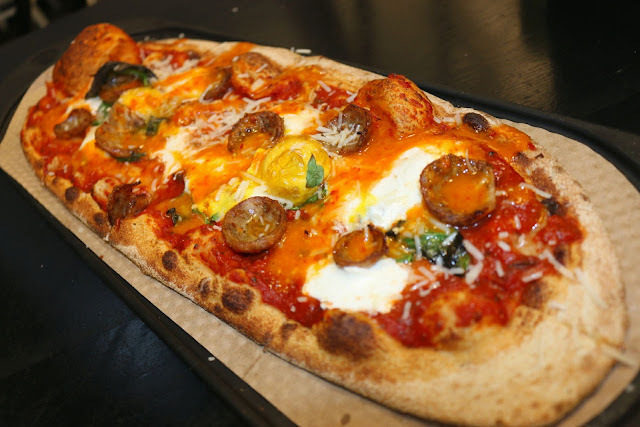 The yolk offers up creaminess along with the fresh mozzarella. For a limited time, &pizza is catering to all of the buffalo chix fans out there. 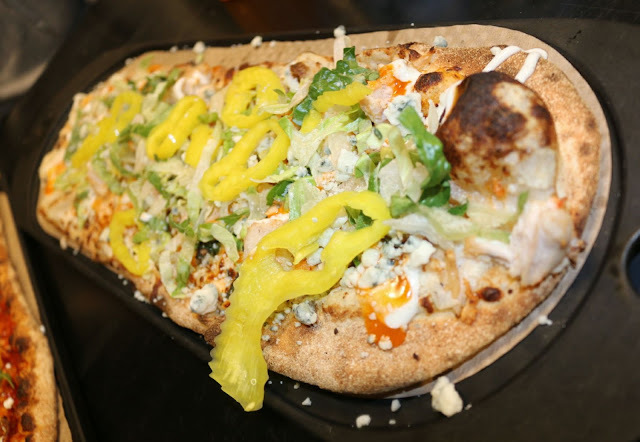 The Dirty Bird is easily one of my favorites - plenty of chicken studded throughout and creamy with the garlic ricotta, ranch, and buffalo sauce. The jalapeno and banana peppers counter the funk of the blue cheese. Need a sweet treat? 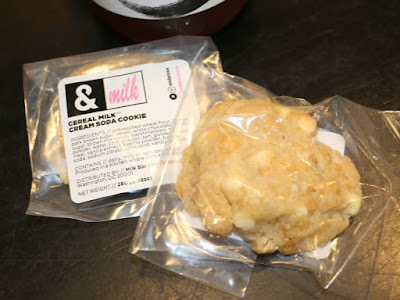 &pizza partners with Momofuku Milk Bar (yes, *that* David Chang + Christina Tosi empire) to offer Cereal Milk cookies to satiate your sweet tooth after indulging in some of their fresh-made pies. 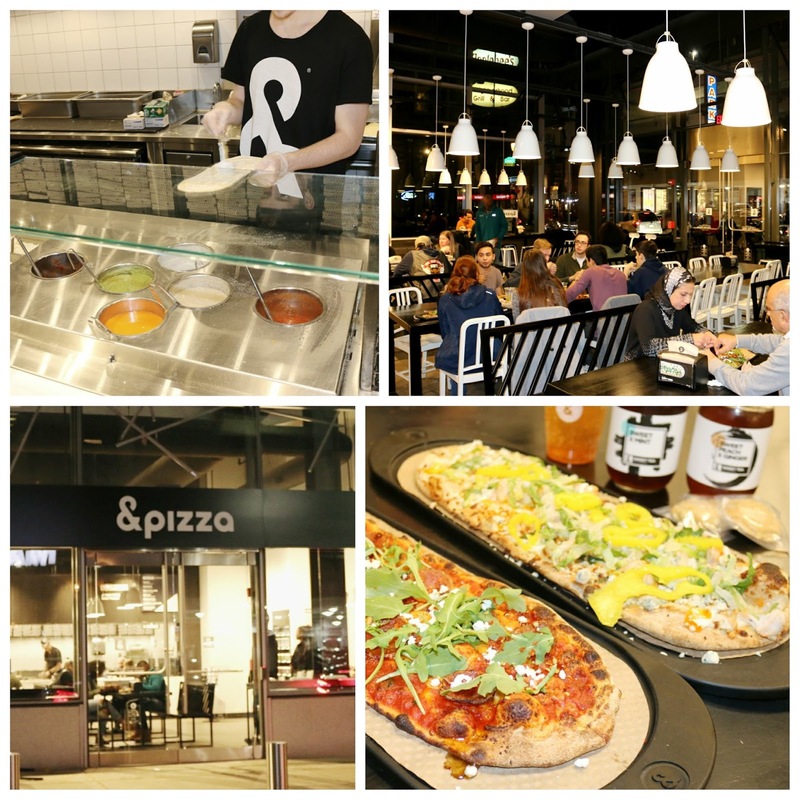 So if you're aching for a fresh-made pie beyond your standard takeout, be sure to stop by &pizza. The staff's friendly and the pizzas come out quick, hot, and are delicious. FTC Disclaimer: Thanks to &pizza and Village Marketing for allowing me to try &pizza. Regardless, my opinions are mine alone and, therefore, unbiased.